Practically all researchers use photography as part of their standard documentation during fieldwork. However, rather than its use as a mere scientific implement, photography has the power to bring voice and narrative to a project. 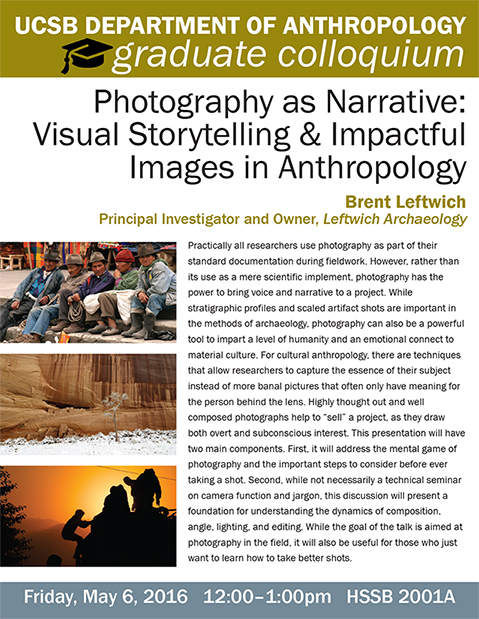 While stratigraphic profiles and scaled artifact shots are important in the methods of archaeology, photography can also be a powerful tool to impart a level of humanity and an emotional connect to material culture. For cultural anthropology, there are techniques that allow researchers to capture the essence of their subject instead of more banal pictures that often only have meaning for the person behind the lens. Highly thought out and well composed photographs help to “sell” a project, as they draw both overt and subconscious interest. This presentation will have two main components. First, it will address the mental game of photography and the important steps to consider before ever taking a shot. Second, while not necessarily a technical seminar on camera function and jargon, this discussion will present a foundation for understanding the dynamics of composition, angle, lighting, and editing. While the goal of the talk is aimed at photography in the field, it will also be useful for those who just want to learn how to take better shots.